Welcome to the new online home of a farmgirl’s dabbles! thoroughly enjoying the fresh space that Lauren at Restored 316 has prepared for me. We’re still working out some kinks in the site, but I couldn’t be more smiley right now. 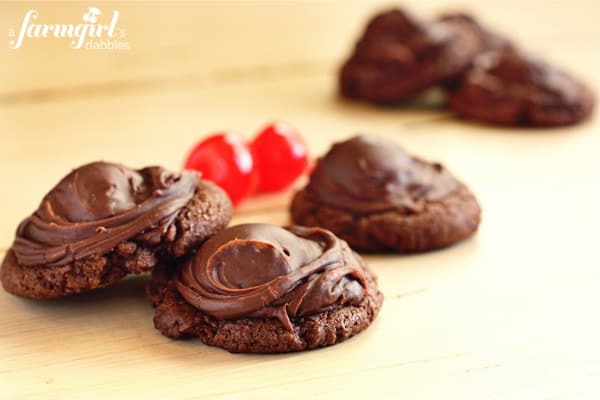 I had planned to share this recipe for Chocolate Covered Cherry Cookies with you before Christmas, as they are a staple of our holiday sweets platter. But then the new blog design came into play. And that design included cherries. So I’ve been holding onto this, a recipe for one of my favorite cookies, in anticipation of this day. You should also know that these make a beautiful Valentine’s Day treat…and that’s right around the corner, folks! Tessa rolled the dough, pressed in her thumbprint, & added the cherries. This recipe is great for getting kids involved in the kitchen. 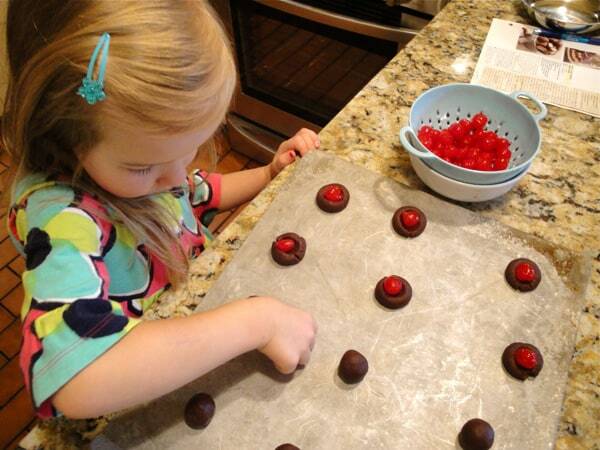 Our girls love to roll the soft chocolate dough into little balls, stamp them with their thumbprints, and then fill the indentations with maraschino cherries. I do believe that part of their desire to be involved is being allowed to snitch cherries during the process. But, hey, that’s our rule around here. If you help, you get to taste test! 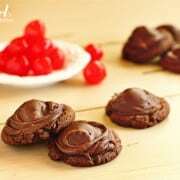 These Chocolate Covered Cherry Cookies are super moist and tender, with an extremely thin outer crust. 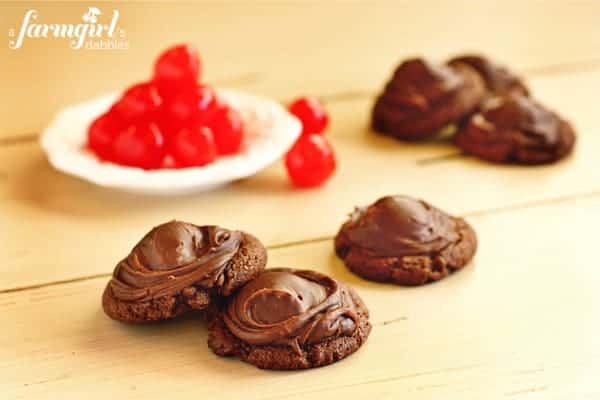 The cherries are topped with a fudgy frosting that gets baked right on the cookies, making them chewy and utterly irresistible. I hope you find them irrestible, too! *****This giveaway is now closed. The winner is Shane R. Thank you to EVERYONE who entered! Simply leave a comment telling me about something new you plan to try in 2012. That something new can be absolutely anything…a paint color you’ve been dying to try on your walls, a new book that’s been begging you to open it, or a hobby you’d like to take up. Me? I’m going to learn how to wield a kitchen torch! Subscribe by RSS feed or email. Leave a comment letting me know. This giveaway will remain open until Wednesday, January 25th, 6:00 pm CST. One winner (USA residents only) will be chosen at random. I will email the winner, who will then have 48 hours to respond. If there is no response, another winner will be chosen. Disclosure: This prize is being provided by a farmgirl’s dabbles, as a token of my sincere appreciation for YOU! Whisk together flour and cocoa in a small bowl and set aside. In a large bowl beat the butter with an electric mixer on medium to high speed for about 30 seconds, or until softened. Add sugar, salt, baking powder, and baking soda. Beat until well combined. Add egg and vanilla. Beat well. Gradually beat in the flour mixture. 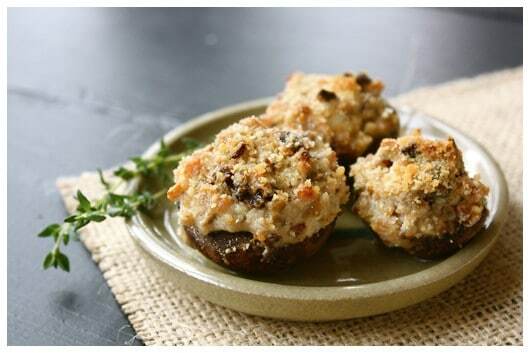 Shape dough into 1″ balls and place on an ungreased baking sheet. Press down in the center of each ball with your thumb to create an indentation. Drain maraschino cherries and reserve the juice. Place a cherry in the center of each cookie’s indentation. In a small saucepan combine the chocolate chips and sweetened condensed milk. Heat until chocolate is melted. Stir in 4 teaspoons of reserved cherry juice. Spoon about 1 teaspoon of the frosting over each cherry, spreading to cover the cherry fully. If the frosting is too thick, just add a little more of the reserved cherry juice to thin it out. Bake about 10 minutes. Remove to wire rack to cool completely. I saw this on Two Peas & Their Pod. mmmm, i made these at christmas. so delicious! This year I’m going to try to get rid of 50% of everything I own. I have so much crafting stuff that I feel like it’s keeping me from being creative. So my goal is to give away half – half my clothes, half my crafty stuff, half my kitchen stuff – everything. That is an AWESOME goal! We all just have so much STUFF. Great to hear from you, Lydia! I plan to *try* and start scrapbooking. I recently bought a donut pan and have yet to use it so that is my “new for 2012” thingy. Btw, these look amazing. Pinned! Nice to meet you, Valerie! Best wishes with your donut pan (yum!) and thank you for pinning! Following you on facebook. I just recently got on the baking kick and am hooked. I LOVE it and am baking and trying new recipes all the time. Something new I would like to try this year is creating my own low-calorie and low-fat cookie recipes. I am going to learn more cooking basics, like how to chop better! I’m starting to shop/eat local, and supporting the small businesses in my area. I have found so many new things and resources in doing this! After 32 years of marriage, I am beginning 2012 with peace and love for myself and my sweet sons. i’m going to try needlepoint in 2012! For 2012, I plan to back up all our digital photos – including printing & enjoying in photo albums. As much as I like to watch the pictures via slideshow, there’s nothing like snuggling on the sofa w/the family & reminiscing with a photo album. That’s quite the undertaking…but so rewarding to have done. Best wishes!! I just signed up for beginner cake decorating class at Michael’s. I have 3 sons and they didn’t care what the cupcakes looked like. But I want to make something special for the granddaughters. So sweet, love it! Have fun with that! In 2012, I plan to become a reader. I’ve never been that interested in reading, sadly, but I want that to change. So far I’ve found a couple books I like reading and hope to continue reading regularly throughout the year. I have been consciously trying to do that myself. I like reading alot, but often find myself only reading magazines, short articles, etc. I’ve been trying to read BOOKS again, and I LOVE it!! My “something new” for 2012 is to get my kitchen organized starting with a remodeling project this Spring and putting together a binder of my favorite recipes. 2012 is going to be a great year! Something that I decided to try this year was to make something new each week to share with my family. My first attempt was an absolute HIT! I made YOUR Lasagna Soup! It was incredible my 10 year old asked for seconds! Thanks for sharing your world with all of us! You’re going to have so much delicious fun this year! I’m so glad you liked the soup. It’s on my list for tomorrow, a very welcome thought in this frigid weather we’re having! Thanks for visiting!! I am hoping to turn my photography hobby into a business this year. I love the chocolate cherry cookies! We made them two years ago for Christmas baskets… they almost didn’t make it out of the house, they were so yummy! This year I plan to make my hobby of photography into a business! I am following via email too. I would like to learn new crafts (all seasons) and take the time to start it up again. No time for me anymore. But the big one is I need to learn how to sew again. I need to make time with my mama.She is a master seamstress. P.s. that is a great question. I wish I had more time to sew! Best wishes for some very rewarding sewing time with your mama in 2012! I’d like to take doula training! I’m trying sewing this year! And probably some chocolate covered cherry cookies – yum! I want to run! I’ve never been a runner, but I’m planning to start training for my first 5K. Hi! I love your website :) I am a new visitor, but will definitely be coming back. My plan to try something new – paint cabinets! never done it and I am a little scared! Nice to meet you! I just painted our kitchen cabinets last spring. After being apprehensive for so long to do it, it turned out to be a welcome breath of fresh air. Only wish I had done it sooner! Best wishes to you! can’t say i have anything “planned” for 2012 – don’t really go for resolutions &/or making plans for the year ahead – more of a do things whether old or new as they need or circumstances are for kind of person. I also subscribed via email and am super excited! My family moved to a new house in a new place this year, so that is a lot of new already, but I am going to try to learn how to knit this year as well. i started off the year with a beginners class and I want to practice and get better as the year goes on. Oops. Link didn’t copy. So I’m going to share about this giveaway on my Facebook page too. I’m following a farmgirl’s dabbles on Twitter. I’ve ‘liked’ a farmgirl’s dabbles on Facebook. I’m going to try Zumba fitness this year. it seems to be a popular workout and said to be fun by a friend of mine that recommends it. I’m learning how to do goldwork needlework. For 2012, I am going to take action and I am going to be more active! I finally moved out of student housing and into a real grown-up apartment with a nice kitchen, so I want to put it to use! My goal is to finally make all the recipes I’ve been bookmarking! I want to lose 10 pounds so I can wear a bikini in Hawaii this June! One new thing on my “to try in 2012” list is making lemon curd. My mother-in-law made cookies like this for Christmas – they were delicious! I plan to complete all my UFOs (unfinished objects) in knitting/crochet – or rip them apart to use the yarn for something else. I also plan to try one new recipe each week in 2012. We missed last week already, but then again we had 3 new recipes in the first week, so we’re still ahead of our plan for 52. I would like to stop procrastinating and get an ebook written this year. Brenda! I love the look of your new blog!!! What was I supposed to say, something I’d like to try in 2012? Well, I’m going to try full-time teaching, blogging, and getting a Master’s. All at the same time. But I’d rather not think about that. :) I’d rather think about these cookies. I just subscribed via email to receive updates. Now time to look around and see what you’ve posted in the past. I shared the link to the facebook post about this giveaway and cookies. I think the neighbor is going to be stopping by to see if I made the cookies yet. I am now following you on facebook also. Ooh, I just found you through the Pinterest chocolate board & I must say I love this idea for the cookies! I actually need to buy some maraschino cherries for the juice to fix my chocolate covered cherries that never got made for Christmas, so now I know what to do with the cherries. I love the look of your blog, but I love turquoise & red and cherries, I’m into retro 50’s era stuff. I’m going to try my best to learn how to use my new iMac that I bought myself for Christmas! I plan to organize all my recipes & cookbooks! Chocolate covered cherries…can it get any better?? Cowboy will love these for Valentines Day! I’m going to try a lot of new ideas from Pinterest to get my home looking spiffy! Pinterest is such a wonderful inspiring tool – best wishes with your home projects! I plan to exercise more and eat healthier this year! I just “liked” A Farmgirl’s Dabbles on FB! Looking forward to great pics & updates. Is it possible to follow you on Instagram? I plan to get moving again this year. I’ve spent the last couple of years developing my cooking skills, gathering recipies, and finding local & organic sources of food. Now it’s time to get moving so i can keep cooking (and eating) all the yummy food I make! Yoga classes here I come! I’m going to try being a mother to TWO, just 17 months apart :-) My second “whoops” baby is due July 11. Wish me luck! I shared about this giveaway on my FB page! Awesome – best wishes on the 10K!! Would really love to learn to knit. And to cook more adventurous dishes. Hello, I am a new follower of yours on facebook and on Twitter to (EIOBoard). Here is what I tweeted: @FarmgirlsDabble has a great giveaway on her blog–check it out! I’m planning on eating more fresh/organic foods and try to stay away from processed. I plan to dry more clothes outside on the line and save some on the electric bill. Just found your recipe “Lasagna Soup” on Pinterest and can’t wait to try it — that’s my first something new of the year. I live in Florida and my youngest daughter lives with her husband in Texas and they were just here for the holidays — we both love cooking and tried several new recipes while she was here — one of our favorites was a blonde fruitcake recipe we found on the King Arthur website. I have some cherries leftover from that, so I may make some of these cookies of yours for Valentine’s Day with the remainder of those!! I just subscribed to your website by email because I can already tell I’m in love with it! Looking forward to browsing for more! Yes, and you did it in the very sweetest way. Thank you, Renae!! I’m going to try and cook more new things for myself and my family! And I followed you on Twitter. My plan for something new this year is to move into a small urban apartment in St Louis from a 3000 sq ft house, then decorate with furniture and accessories specific to that space. Have never done anything like that before! I like farmgirl dabbles on Facebook. This year I’m tackling making my own yogurt and cheese at home, can’t wait to give it a try! I’m going to cook/bake one new recipe a week (if not more!). This should be fun and challenging as a college student trying to vamp up my cooking/baking skills. I follow farmgirl dabbles on twitter! I am going to try to master the French macaron this year! Welcome to your new space! It is lovely! This is such an awesome giveaway! :) Something new I plan to try in 2012? That would be making artisan bread at home. Can’t wait to get started on that. The Amazon gift card would comes in handy so I can get the recipe book to learn how to do that. I want to learn how to quilt! I want to make croissants. I’m going to improve on the guitar. I am going to learn to knit so that I can carry on my gramma’s tradition of giving Christmas stockings to new babies in the family. Love your new site! I will be watching for kitchen torch ideas. I got one for Christmas. I plan to tap into my creative side and do some painting on canvas. 365 geocaches are also on the to do list. Thanks, Danae. A torch has been on my list for the past year – I used some Christmas cash to buy one. Using it tomorrow – yay! I would love to see your paintings!! I surfed into your blog and I love it!!! I’m going to try very hard to start going to the gym. I have the membership. I simply don’t use it. Thank you, Sue! And best wishes in 2012! 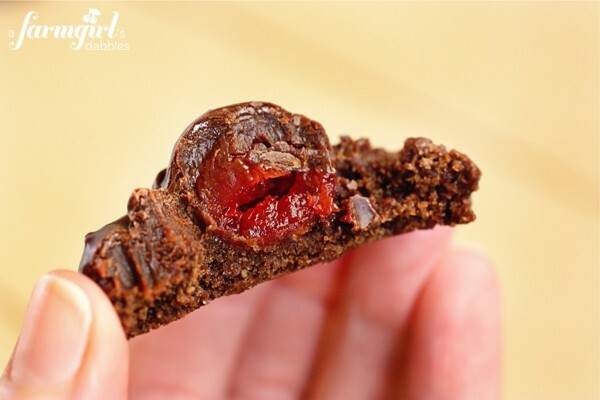 Tranport my mouth immediately to a Chocolate Covered Cherry Cookie. Wow! I want one – it’s gorgeous. I think I can do this! I am going to make a more concerted effort to reach out to young people, to encourage them, to praise them, to uplift them. This isn’t something necessarily “new” for me, but something which I need to do more often. Your new design is beautiful. Love it. You are such a lovely kind hearted person, Audrey. I know this firsthand & I thank you. The new thing I want to do in 2012 is sew my very first quilt! also, i shared this giveaway on facebook! brenda, i really like the new look!! my new thing for 2012 is to be more forgiving. I am excited to try some freezer cooking this year – especially since I am starting a 37 hour work week January 23! I used to love chocolate covered cherries when I was younger but found them too sweet as I got older. However, having them tucked inside a cookie like this is totally up my alley and this recipe is getting bookmarked. I love your new *home*, it is clean and fresh and your header is adorable :) Also love your cherry graphic in your blog titles and in your own comments. BTW…your daughter’s top is too cute. This year, I am going to learn to make caramel from scratch. I tried it, for the first time, this month — and I FAILED. :D But I am going to keep practicing and get it down, darn it! Yum! I love homemade caramel. Don’t give up – it’s all about find that perfect temp with your kitchen thermometer – you’ll get it!! I’m going to try a marathon!! I want to try my darnedist to stay organized all year long. I am in the process now of getting our entire house paper organized and I am going to try really hard to keep it that way to make my life easier!! Staying organized is a never ending task (and one that I’m not always very good at), but so rewarding. Best wishes!! This weekend I am making lefse for the first time with my new lefse griddle. Have a great weekend. Hi Josie! Yay – a lefse griddle! Sounds like a great plan for the weekend. Wish I knew how to crochet!! These cookies look sinfully delicious!! Love the look of your new site too. Thanks Karyl for all your support – I appreciate it! Happy New Year to you! I plan on trying new recipes in 2012! I just got a new dslr camera, so I plan to learn all about it and taking good pics! What a beautiful blog you have! I’m working on making my bedroom a cozier haven, a place I want to spend more time in. That’s been on my list, too! Nice to meet you, Shannon. Not funny at all! Best wishes with your cupcakes! I buy chocolate covered cherries for my 3 girls every christmas! I think I know what I am making for our Valentines Day treat this year! As far as something new…I am getting married after 25 years of the life of a single mom! I have until May 27th to loose some weight, plan our outdoor wedding, and remodel my fiance’s house so we can either rent it or sell it. Busy times, but I have never been happier. Well, CONGRATS to you!!! You have a very exciting 2012 in store! I plan to take some classes at my local community college. oh I LOVE your new look Brenda!! you and Lauren did a fantastic job! I shared on FB. Also posted on my blog and sent to my email list. I plan to try making tutu’s this year. I retweeted your original post about this giveaway. I want to learn to make macarons–have never tried! I think your blog is really nice and I am sharing about your blog and giveaway to my other Facebook wall: Merry Cooking Contests! A group of foodies who love to enter recipe contests!! This year I want to start a blog, get out on my bike more, and get more use out of that cocktail shaker gathering dust in my pantry by having more happy hours. We could all use a little more happiness, wouldn’t you agree? Love the new look. Is there a creme brulee recipe somewhere in your future? I just subscribed to your email! Thanks! I twittered about this giveaway! Merrylambs54 is now following you on twitter! I just posted the giveaway on my Merry Graham facebook page. Merry Graham is following you on facebook now! As of tonight, I plan to make marshmallows sometime this year!!! I have a few plans this year, my first is to put in a raised garden, I always have a garden, but wanted to give a raised garden a try in another area of the yard and expand on what we have planted in the past. My other is master making a pot of Chicken and Dumplings for the hubby. going to try and get into sewing this year…that machine has been sitting in its box for two years I think! wish me luck! These cookies look adorable! And I love the new layout, it’s so happy and red and cheery (not that your old one wasn’t). This year I plan to maybe try more vegetables (I never eat fruits or vegetables) or maybe become more fashionable. I like how some people can pull off some things I think are cute, so I’m going to try and mix up my wordrobe a bit. i want to try crocheting! I’m going to cook more healthy foods. I will bring my kids on an overnight trip to the beach for the first time. So far, we’ve only done day trips with both kids because of their ages. I will be trying one of your cookie recipes. I’m trying to decide on a new color for my bathroom, have a paint chip and hopefully will be making a decision soon. Thank you for the opportunity to win and I really enjoy your site. So nice to hear from you, Ann! Thank you – and best wishes with that paint color! I plan on trying to bake more foods from scratch! 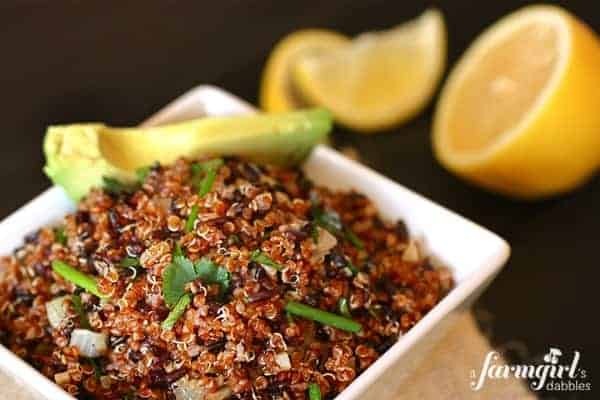 your food photography is stunning! Thanks for a super giveaway! I follow a farmgirl’s dabbles on twitter. I like a farmgirl’s dabbles on Facebook. My new hobby is to really get into bread making. I want to learn how to make my own sour dough starter , make bagels, French rolls , etc…. Hello there Lovely – so nice to hear from you! You’re so sweet – thank you & Happy New Year to you!! Luv the new look! I plan on being in the best shape of my life as I approach the age of 52! Thank you, Linda. And good for you – love your plan! This looks AMAZING! I love cherries, so much so that when I bake something involving them I buy a bigger tub so I can eat some! Great new layout and all the best. This recipe looks and sounds so good. I love your helper.This year I am going to try to read more. I have many books on my Kindle waiting to be read. I have recently acquired some sour dough starter so I plan to try making sour dough bread in 2012. I follow your blog via email. Thanks!! I am going to try to slow down this year and truly enjoy the time I spend with my husband and two daughters. I plan to try double-knitting something this year. I want to make homemade mayonaise. I plan to make baked donuts for the first time this year. Thanks for the chance to enter. Thank you, Deb. And best wishes with your writing in 2012! I adore your new look. Lauren is so talented! I’m trying running in 2012. Ugh… but I’m starting to love it! Thank you, Kristen. Lauren has been a pleasure to work with. Running, huh? My husband got me into running after we were first married. But that disappeared once kids were in the picture, until late last summer when I started dabbling in it again. There is something about it that is so very good, that I crave. I just need to get a better routine down (MN winters sure don’t help!). Best wishes to you!! I liked and shared your giveaway on FB. I am going to try making homemade Spagetti Sauce this year! I also follow you on email. I am going to make homemade bagels and want to get better at cooking Mexican food. I am going to try to make homemade sausages. I am going to try meditation and healthy eating. 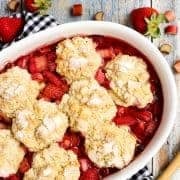 I love reading your blog and trying your recipes! I love the new look!!! My something new will be learning how to make fresh pasta with my new pasta press attachment for my kitchenaid – I am super excited about it! I hear you will be joining us pork people at our Taste of Elegance next week. It is really a great event – we love it and I think you will too. We will find you there and help introduce you to folks! Hi Dianne – so nice to “see” you! Lucky you – a new pasta attachment! I have a hand crank version that we used to make pasta with pre-kids. I really should dig that out again. The girls would have a blast with it. Yes, Blake & I will both be attending next week – I’m happy to hear you’ll be there (I was hoping so). See you then!! Thanks for entering, Elena – and best wishes with your running in 2012! I subscribed to your email list so I won’t miss a thing! I just posted the following comment as well: In 2012, the something new will be transforming my guest room into a guest/BABY room, as I’m going to be a gramma for the first time (God willing!) in June. I’m so excited! In 2012, the something new will be transforming my guest room into a guest/BABY room, as I’m going to be a gramma for the first time (God willing!) in June. I’m so excited! So nice to meet you, Karen. How exciting – a baby room for your first grandchild! Fun!! I love your new look! I follow you on facebook and I’ve been secretly trolling your website for a while! I just pinned your lasagna soup and these cookies to my pinterest deliciousness board too! In 2012, my new thing is to attempt to be run. More than I’ve ever run before! I’m hoping to complete 2012 miles in 2012. It’s a big challenge for me, but with all of the amazing recipes I keep finding on your site and others, I need to keep moving to make up for it! Thanks for bringing such great recipes to life and sharing them with us! Thank you so much, Emilie – I appreciate your kind & supportive words, and your sharing of what you find here. And, wow! Good for you – 2012 miles is an awesome goal for the year – best wishes!! I subscribe to A Farmgirl’s Dabbles’ RSS feed via Google Reader. Thank you, Sarah! And best wishes with your kitchen challenges – it’s fun to stretch ourselves and be amazed by the process and outcome. And the deliciousness! Beautiful new look, Brenda! Congrats. :). Something I’m going to try in 2012? Achieving more balance while raising two small children. Really. That’s my goal. Wanting to do it all, and do it all well. We’ll see! Thank you, Laurie! That’s a big goal, not to be taken lightly, for sure. My very best wishes to you! I love love love the new look!! The cookies look pretty tasty too:) Goal is to live every day with gratitude. Thank you so much, Maria. Lauren was a peach to work with. I love your daily gratitude goal – we’re on the very same page. Just added the “one thousand gifts” app to my phone last week, to hold myself accountable. Love the photo function – so easy to capture and remember a precise moment. Best wishes! I love the new design, Brenda! It looks great!! Hi Alyssa!! Thank you & Happy New Year! My goal is to get moving more. Walk, dance, yoga…just move. Thanks, Kara! So I had to go look that one up (ha!) – let me know how it goes!! In 2012 I plan to spend more time traveling and with friends and less time watching TV. 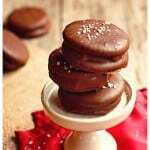 Great site, I am going to try making these cookies gluten-free! I’ve made a similar cookie before and loved them! And I absolutely love your new look – gorgeous! There is so much I want to try in 2012. I would love to learn how to make macarons! Thank you so much, Deborah! And best wishes with the macarons – I have yet to try my hand at that! I have you liked on FB. These look great!! Something that I would like to learn in 2012 is to bake my own bread. I’m hoping to try a new recipe every month. I love the new site design! L0ve your website!!!!! I plan to try one new soup recipe per week! Can’t wait! Thank you, Dee Dee! I have been on a soup kick myself – it’s just so comforting and satisfying. Best wishes! I’d like to try the Tread Climber exercise machine. Sounds like a great plan! Thanks for visiting!! those cookies look amazing! I’m going to try colorwork knitting and I’m going to try to sew myself a few skirts. It appears to be so simple….ha! Ahhhh…I wish I had more time for things like that! Best wishes!! Always looking for new cookies recipes to try so thanks for sharing. 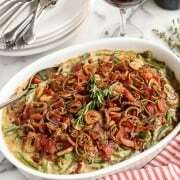 I have lots of recipes saved up, I would like to try one new one every week. Just factoring that into an already stretched budget seems like a daring thing to do. Following along on FB. Thanks for the chance. Awesome New Site. Love it … Need to make those cookies & for me I am going to give Kettlebell workouts a try. Actually 1st workout is today! Thanks for the chance. Thank you, Ellie! And best wishes with the new workouts! THese look wonderful! Great new site! Thank you, Jodie! And best wishes with the herbs! I want to learn to play the guitar and actually practice! I love that idea!! Great to hear from you – thanks! I’ve been trying to do that, too. There’s so much I never grew up eating. And it’s all so delicious! Best wishes! something new, huh? i would really like to tackle learning spanish. it’s something that’s been intimidating me for years, but i feel like i need to do it…. Good for you! A foreign language or two is something I wish I had under my belt. The cookies look so good and I can’t wait to try them. For 2012 I’m going to start making homemade bread every week. I have been putting it off I live at 7200 feet and worried how bread will turn out. I’ve been here one year and I’m now ready to try. I’ve just started making some bread myself – it’s very rewarding. Best wishes!! cookies with us over Christmas.